Customizing Your Outreach Just Got a Whole Lot Easier! 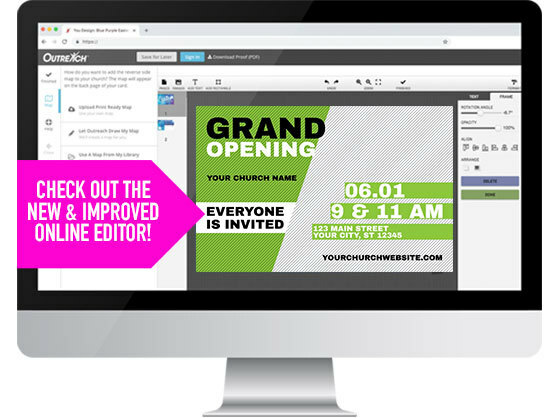 A new simple way to customize your outreach tools online has arrived. Our new online editor blows the old one away - but you don’t have to take our word for it. Try it out, for free. In a matter of minutes, you can customize a banner, postcard, invite card or other tools and receive it in a few days. 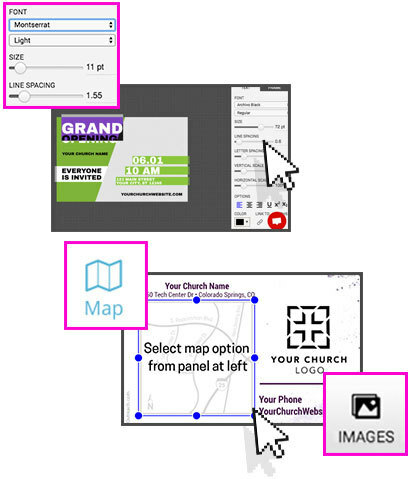 From postcards to 8 foot banners, customizing for your church has never been easier! 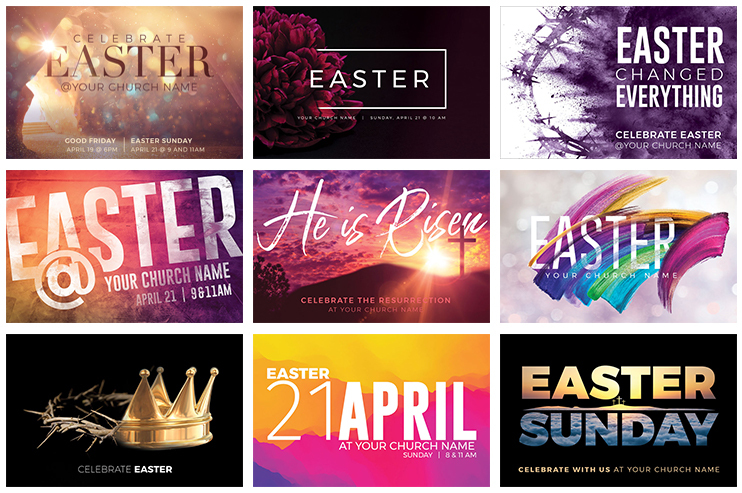 Tons of designs to choose from - whether you're planning your Easter outreach, a new location launch, or any other event, you can easily and affordably get postcard invitations, all kinds of banners, new square invitation cards (on sale now), and more - all customized so that you can reach the most people in your community. Select an Easter product to start customizing! Q: I want to upload a graphic or picture to my design, what formats are acceptable? A: The editor accepts .jpg, .tif, .pdf and .png files. Q: How do I get access to my map and logo? A: First, make sure you’re logged in. Then if you still can’t see your art files, call or chat us and we can assist you in getting access to your files. Q: Can I save my work for later? A: Yes, make sure you are logged in and then you can use the Save for Later button at the top of the editor. To access your file later, you can log into your My Outreach account and click the “My Saved Designs” link to see all your saved items. Then click “edit” to make changes. Q: Can I download a copy of my work to show other people? A: Yes, just click the “Download Proof” button at the top of the editor to get a PDF of your project. Keep in mind that the colors you see on your screen may differ slightly from the colors in the document you print out. TIP- Yes, just click the “Download Proof” button at the top of the editor to get a PDF of your project. Keep in mind that the colors you see on your screen may differ slightly from the colors in the document you print out. Q: What do the Format Frame & Format Text Panels do? A: Editable text is contained in a frame or box on the design. In the format frame panel, you can change the properties of the entire frame. The Format Text panel allows you to change the look of the text within a frame. Using this panel you can change the font, the size, the spacing, the text color and the justification. Q: How do I add or move a text box? A: To add a new text box to the design, click the Add Text icon in the gray bar above your design. A new frame will appear that says “Add text here”. Now you can click on the new frame and drag it to where you want it, and adjust the size of the box. Clicking on the text within the box allows you to change and format the text. Q: How do I add an image/graphic or map? A: Click the Images icon in the gray bar above your design. You can now click the down arrow next to the upload window to check if the image you want is already available to select. If you don’t see what you want, click the Choose button and select the image you want on your computer. Now you should see the file name of the image - click the upload button and your image will be added to your design.In addition, a new format pane opens up on the right side of the editor and allows you to make simple edits to the image. Q: Why can't I edit the mailing panel on my postcard or change some of the text or background of my product’s design in the editor? A: On a postcard mailing, the U.S. Postal Service has strict requirements for addressing areas. Adhering to their standards provides the lowest postage rates. All of our mailing templates are designed to these specifications and cannot be edited. You'll find that some designs have graphic elements that are not editable. We've "locked them down" for a few important reasons, either, to safeguard against inadvertently using images in a way that may create licensing infringement, to retain the integrity of hand-drawn graphics or fonts that cannot easily be edited, or where certain design elements are deemed to be essential to the aesthetics of the design. If you'd like to make modifications to any of the elements that are not editable in the online editor, our professional design team would be happy to assist you with your project for a small design fee. Q: What if I need help finishing my design? A: If you decide that you need assistance from our professional design team, just click the Help button in the left hand bar of the editor and then select “Use our Design Service” and follow the prompts. Q: Why does it show I have two pages on my document? A: If you see two pages in the editor for your project, that means there is a front side and a reverse side that are available for you to edit and customized for your church. Q: How do I access special characters like letters in other languages? A: Select the area of text where you need to insert a special character, then in the Text Format bar on the right side of the screen at the bottom is a button called “Glyphs” - when you click this button you will see a large selection of characters you can scroll through and add to your text line. Q: How do I make my text Bold or Italic? A: Select the text you want to modify, and then in the Format Text frame on the right side of the editor window, click on the down arrow of the second window under the word FONT. This will show you the formatting options for that font. Q: Can I use the logo, text or images from a book, movie, website or other product on my design? A: There are two important considerations when uploading art for use on Outreach products: resolution and licensing. Resolution refers to the amount of information (pixels) in your image. Most images pulled from the internet are low resolution (72dpi) and optimized for display on a screen, print-quality resolution is more than four times larger (300dpi). So its best to avoid images from the web unless you're certain the resolution is print-quality. The other issue is Licensing. Making sure you have appropriate licensing for your image, it is vital in assuring your church doesn't get into legal trouble with the rightful owner of the art. If you created the art (a photo you took or logo you designed) you own the art, but all other art is owned by someone else and you must acquire licensing before reproducing it. If you find art on the web, make sure to save the licensing information from where it was downloaded, in case you need to prove your right to reproduce it. Q: I added a rectangle to my document, how do I change the color of the border and fill? A: Once you have added a rectangle, clicking anywhere in the rectangle will open a format box on the right side of the editor. From this box you can change the appearance of the rectangle including; the border, using the ‘stroke’ drop down, the color inside the rectangle using the “fill” drop down, the rotation angle, the opacity and more. To completely remove the border around the rectangle, reduce the stroke weight to 0 pt. - changing the stroke color will not remove it completely. Q: What is the function of the Undo arrows at the top of the editor? A: Like other computer programs the undo and redo arrows allow you to revert to a previous step in your editing (undo) or to reinstate something you have changed or deleted (redo). Please note that these options only work during your current editing session. Refreshing or reloading the editor page will also refresh your editing history. Please note that changing your map option causes the web editor to refresh the page and you will lose your editing history.